Wat Chedi Luang means - the temple of the great Chedi. In 14th century King Saen Muang Ma began building the Phra Chedi Luang to enshrine the relics of his father at the end of the 14th century, but King Tilokarat completed it. The chedi used to be 90 meters high before it was partly destroyed in an earthquake in 1545, it was to remain the tallest structure in Chiang Mai for over 500 years. The present restored chedi is about 60 meters high. For the 600th anniversary of the chedi in 1995, a copy of the Emerald Buddha made from black jade was placed in the reconstructed eastern niche. In the rear of the grounds are two small chapels built in Lanna style. The first chapel contains a wax statue of Ajahn Mun Bhuridatto, a former abbot of Wat Chedi Luang and one of the founders of the Thai forest tradition of meditation. The next door is Luang Ta Maha Bua and he was the disciple of Ajahn Mun Bhuridatto. 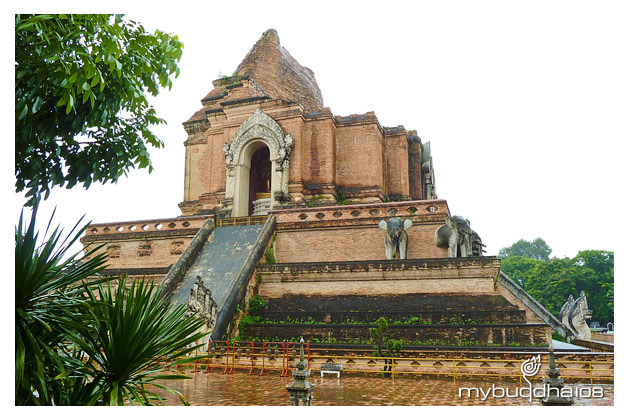 The temple grounds were originally made up of three temples - Wat Chedi Luang, Wat Ho Tham and Wat Sukmin.